(fr. L. miluus), 1. 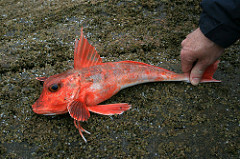 Aspitrigla cuculus, Eng red gurnard. These spindle shaped saltwater fish are normally 25 cm long but can reach 40 cm. They are the smallest gurnards in Europe. They are red on top. The head and sides have silvery pink rows of large scales. As all gurnards, they have strong spines and protective bony plates on the head. The pectoral fins contain sensory organs, which are used to feel for food consisting of crustaceans, small fish and other invertebrates living at the bottom of the sea. The gurnards live in sand, rocks, mud, and gravel seabeds in the Mediterranean and the Atlantic to the west coast of Scotland, but are rare along the Norfolk coast. See milano real. If you don't like fish, you will break your rule! Have the fishmonger scale and gut the fish and remove the head. Mix 6 tbsp olive oil with zest from one orange. Let sit 1 minute and pour it over fish. Put fish in oven. Pour 1 c white wine over the fish when half done. Continue cooking until done. Cut tops off of artichokes. Remove outer leaves. Boil in water until soft. Remove from water and turn bottom sides up on paper towel to let the water run off. Sautée onion. Slice mushrooms and add to the onion. When the mushrooms are almost done pour ½ c sheery over them and add artichokes cut in half. When the fish is cooked, remove from oven. Brush a coat of the sauce over it. Pour pan juices and sauce into a frying pan with the mushrooms. Fry until mushrooms are done. Add artichokes to heat. Prepare a sauce combining 2 tbsp olive oil, 1 c fish broth using pan juices and juice from one orange. Place the fish on a platter. 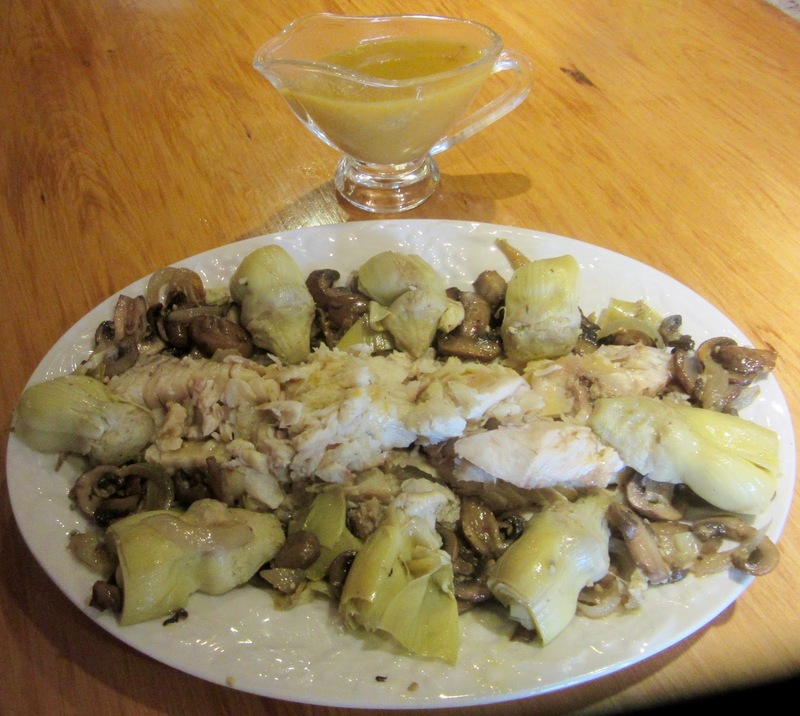 Garnish with artichokes and mushrooms. For lack thereof turbot was used. MIRLO SING A SONG OF SIX PENCE!